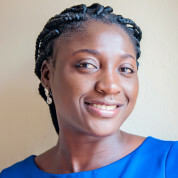 A 2014 Young Global Leader of the World Economic Forum and Vital Voices Lead Fellow, Bernice holds a Bachelors in Business Administration from the Christian Service University. She has had over 15 years of experience in development sectors with NGOs and projects and skillful in quantitative and qualitative programme planning and implementation, projects implementation, monitoring, training, assessments, reviews, baseline surveys and evaluation. Bernice is the Founder and Executive Director of the award winning Ghana Bamboo Bikes Initiative and also doubles as the National Coordinator of the National Free Shoes and Educational Supplies Program which complements the Government of Ghana free school feeding and free uniforms program by distributing free shoes and educational supplies to needy school children from deprived communities in Ghana. Bernice is the Founding Curator of the Kumasi Hub of the Global Shapers and sits on the advisory board of the WIPO Green in Switzerland and a member of the Global Agenda Council of Natural Capital and Biodiversity of the World Economic Forum. "The idea of giving a global recognition and appreciation to teachers to encourage and inspire them to deliver quality education and remain committed to their profession makes the prestigious Global Teachers Prize initiated by Varkey Foundation worthy of support."